RESINTECH is a fully integrated group involved in innovating, designing, manufacturing and marketing a diversified range of uPVC and Polyethylene products. RESINTECH has been constantly pushing ahead, achieving goals after goals due to the untiring effort and able leadership from the Man at the Helm – The Founder and Managing Director, Dato’ DR. TEH KIM POO whose experience in manufacturing and trading dated back to 1977. He is assures an ever vibrant approach to the business of RESINTECH. One of our subsidiaries, Resintech Plastics (M) Sdn. Bhd., owns a modern plant with State-of-the-Art Production Machineries. It has an experienced and highly qualified work force, advanced production techniques, an efficient infrastructure and long-term sustainable solutions to serve customer needs which had been accredited the MS ISO 9001:2000 for Quality Management System. RESINTECH had enhanced its competitiveness to meet the challenges of Globalization, arising from the advent of the AFTA. Staying ahead means hard work in the days ahead – we are to the task! RESINTECH has a bright future based on the solid foundation consistent Quality Management System. 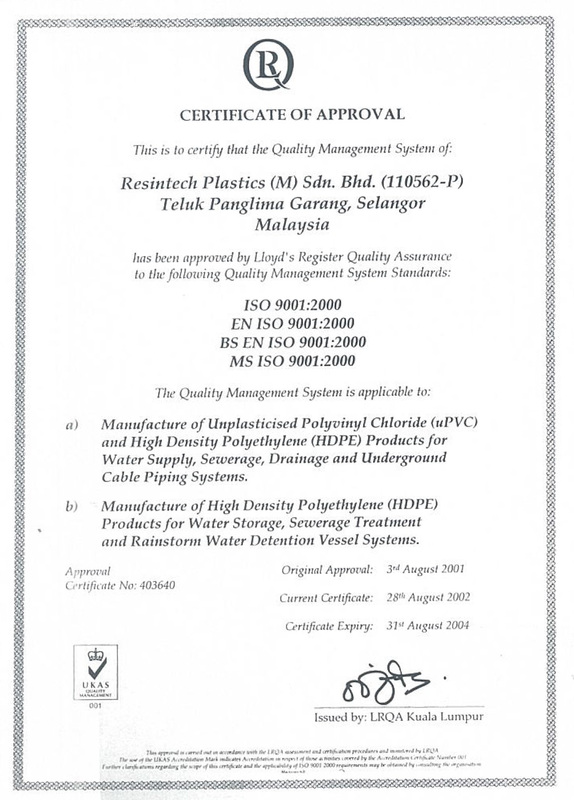 Resintech is projected to become the manufacturer and marketer with the widest range of plastic pipes and containers in Malaysia. Resintech, in its well diversified lines of business, will progress with new opportunities and be the leader in an ever changing market. We will be driven by our commitment to continuous quality improvement and to meet in all of our customers expectations. We will gain competitive advantage through this, and by building on our existing strengths and developing new competencies. We will be market driven, efficient, excellent and successful. Our success will make Resintech a company that our customers, employees and communities can depend on. We place customer care as the top priority. Employee care is at the heart of our business. We nurture our employees through training and development in the belief that it is only through employee care that we can sustain the quality of our service to customers. Through innovation and use of advanced technology we strive to maintain the highest standard consistently throughout our wide range of products. Every task can be continually improved. We value tramwork to build an effective employees mutual relationship. Effectiveness increase when we exchange ideas and share responsibilities. As the Company continue to innovate through developments is valued to sustain the vitality in our business. We value honesty and integrity to build a trust.